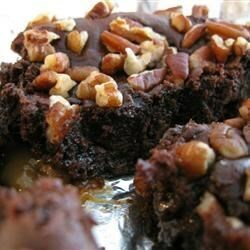 "These are so moist and so fantastic that you won't want to stop eating them! They are a brownie version of a confection called Turtles. These are just as good." Unwrap caramels and place in saucepan with 2 Tablespoons evaporated milk. Melt over medium to low heat, stirring constantly. In a large bowl, combine the remaining evaporated milk, dry cake mix, and melted butter. Stir until well blended. Spread half of this mixture in the prepared pan. Bake for 10 minutes. Remove brownies from oven. Sprinkle chocolate chips and drizzle melted caramels over the top. Drop remaining cake mixture by teaspoonfuls over all. Return to oven for 20 minutes. Garnish with whole pecans if you'd like. Very moist & tasty. Used caramel ice cream topping instead of caramels. (Saved time from unwrapping the candy!). Used it as a base for ice cream sundaes. Family enjoyed them although the middle batch from the pan were quite goopy. I will cook them a bit longer next time.